Offers guided big game hunts in Montana. Hunting, and fishing throughout the northern Adirondacks. Specializing in fly fishing, upland hunting, and bird dog training. A luxury hunting and fishing resort located near Raton, New Mexico. Offers guided hunting and fishing, specializing in turkey and deer hunting and fishing in the Hudson River. Barramundi fishing and wild boar hunting in Arnhemland, in Australias Northern Territory. Duck hunting, goose hunting, crappie fishing, and bass fishing on the Tennessee River. Articles written by experienced hunting and fishing enthusiasts. Directory of links to fishing and hunting guides, outfitters, classifieds, and leases. Spring black bear hunting, walleye and northern pike fishing. Discusses hunting, fishing, cabins and rates. Kentucky regional hunting and fishing exposition. A site with hunting and fishing links,and photos. Analyze and report on upcoming fishing and hunting opportunities. Offering black bear, deer, grouse and woodcock hunting, and salmon and trout fishing. Includes details and contact information. Located in Nictau. Offers black bear, deer, moose, upland bird hunting and atlantic salmon fishing. Includes photo gallery, rates and contact information. Located in Knowlesville. Guided fishing and hunting adventures in Montana. Fishing trips on the blueribbon Bighorn River and hunting adventures on private ranches. Covers fishing guides, hunting guides, outfitters and charters. Includes online shopping information for outdoor gear. Michigan hunting and fishing communities post their outdoor experiences, including sections for fishing, hunting, trapping, and camping. Guided fishing and hunting adventure trips in southern Oregon. Season calendar, fishing and hunting reports, Oregon license details. Offers a state by state listing of guided hunting and a fishing trips, as well as hunting and fishing leases available, trophy pictures and a message board. Features hunting and fishing tips, regulations and licensing information, safety tips, recipes, and a visitor trophy room. The purpose of F&H News is to find, analyze and report on upcoming fishing and hunting opportunities for local anglers and hunters. Choose from 8 regional editions! NBHFC is a local hunting and fishing club located in rural PA. Fishing articles and fishing tips by professional fishermen. Rusty takes you hunting and fishing in the great American outdoors, featuring the latest in outdoor products and hunting & fishing accessories. Offering boat and fishing equipment rentals, accommodations, camp sites, and exclusive access to trout and kokanee fishing. Information on rates as well as fishing and hunting regulations. Fly-in hunting and fishing outfitter offers trophy whitetail hunts in remote northern Saskatchewan. Also provides trophy bear hunting and trophy fishing for northern pike, walleye, arctic grayling. Tips, pictures, and stories of hunting and fishing in Texas. Fishing stories, recipes and photos from a collection of fishermen. If the business hours of Upper Canyon Outfitters in may vary on holidays like Valentine’s Day, Washington’s Birthday, St. Patrick’s Day, Easter, Easter eve and Mother’s day. We display standard opening hours and price ranges in our profile site. We recommend to check out ucomontana.com/ for further information. 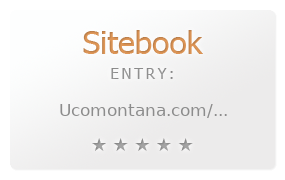 You can also search for Alternatives for ucomontana.com/ on our Review Site Sitebook.org All trademarks are the property of their respective owners. If we should delete this entry, please send us a short E-Mail.